On 12th March we stopped and took a few minutes to remember our great leader and friend Terry Pratchett who took Death's hand and left us three years ago. In the last three years it is heartening to see Terry's legacy continue. We're still as busy as ever, still loving the interaction with other fans and are particularly looking forward to the Convention in August. There's still lots to look forward too. We've just heard from Neil Gaiman's Twitter feed that filming has wrapped on the Good Omen series and now the serious work of post production begins. From the pictures we've seen leaked via Neil's feed it's going to be seriously fun. We have heard, on very good authority, that some official news about The Watch TV series will be coming very soon. This April is seriously packed with stage productions and events around the world to celebrate what would have been Terry's 70th Birthday at the end of April. Check out the relevant sections for more information. For once there may be an event near you! Last month we launched our new look HTML version of the newsletter. We had quite a lot of feedback on the new look [mostly positive - RAR] . The biggest complaint was that the links in the table of contents were not working on Apple phones and tablets. After doing much research into the matter (with the kind assistance of Andrew Molloy) it appears that this is an issue that Apple introduced in iOS 8. Apple appear to no longer support internal links in emails. Sadly there is nothing we can do about this. The Table of Contents works fine on our website and should work inside gmail, outlook and on android phones. As far as we can tell the only place it won't work is with Apple mobile products - sorry. We have included a "View in Browser" link to get round the problem and have also moved the table of contents to the bottom of the email. This month we have finally got around to releasing our new Soul Music mug design. Featuring Imp, Glod and Cliff mid concert, this is a design we are really proud of. Have you been to see a play or a Discworld related event and want to write a review about it? If you are putting on a stage production or know of a stage production near you, please email us and let us know about that too. 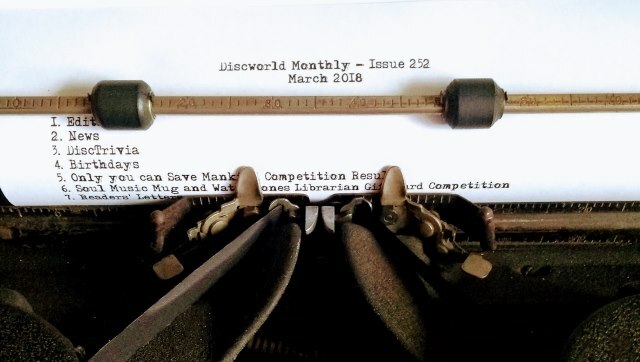 The deadline for submissions to issue 253 of Discworld Monthly is Friday 20th April 2018. CVHF is the largest festival in the UK dedicated entirely to History and it takes place in the heart of the chalk. There will be a recreation of Terry Pratchett's extraordinary writing office in a new special exhibition called The Shed of Doom. On the Sunday morning, courtesy of the Discworld Conjurer's Guild, the festival will be welcoming the fabulous and award winning Time Travelling Magicians Morgan & West. The festival contains lots for everyone, from air displays, to Living History exhibits, History Tellers to the Red Devils and much more. More information about the Pratchett Element will be forthcoming in the near future and we will keep you updated via our social media feed. Chalke Valley History Festival runs from Monday 25th June 2018 until Sunday 1st July 2018. Tickets will go on sale in April alongside camping tickets. Good Omens finally wrapped up filming on Saturday 10th March. "Over a hundred days of shooting. We've been frozen and broiled sandstormed and snowed dogbitten and burned down. We've not had any two days of shooting that were like any other two. Through it all we've persisted telling a story about Peace vs War about looking after this world because it's the only one we have about making the right choices. Thank you all of you from Terry Pratchett and from me." And Douglas Mackinnon said this on the same call sheet. "Thank you everyone for completing this marathon shoot. It is hard to believe that principal photography is over. 109 days of Good Omens. To the UK crew that have seen it through all the days I'd give you medals and a place in heaven if could if it wasn't or the fact I don't believe in hierarchy or heaven. So delight at your work will have to do. To the UK crew that didn't come with us if you are listening we missed you here. To the SA crew you have delighted and surprised us on a daily basis. Thank you all!" March also saw the announcement of a surprise guest star in Nick Offerman. Currently it looks like we will get this on Amazon Prime as of Feb / March 2019 with the UK BBC showing it fairly rapidly afterwards. It will feature six, one hour episodes. Neil Gaiman has gone on record to confirm that the series is very much a Good Omens Plus as many of the scenarios that Terry and himself discussed for a sequel to the book have made it into the series. There is also hints of it coming out as a boxset on DVD and Blu-Ray. As soon as we know more on release dates, we will let you all know via our social media channels and the newsletter. The known cast list (to date) looks like this. Some well known names amongst them, including a man who once played Terry Pratchett in the documentary Back In Black. Terry Pratchett: HisWorld has been shortlisted for the Best Temporary or Touring Exhibition award in the Museums and Heritage awards 2018. The Museums and Heritage awards are in their 16th year. The 13 different awards recognise projects of excellence, innovative and groundbreaking initiatives from galleries and visitor attractions across the UK and overseas. This year there were hundreds of entries and the judging panel had a very hard job to whittle them down to the final shortlist. The judging panel are Bernard Donoghue, Director of ALVA, Diane Lees, Director General of the Imperial War Museums, Matthew Tanner, Chief Executive of the SS Great Britain Trust, Stephen Duncan, Commercial and Tourism Director for Historic Scotland and Maggie Appleton, Chief Executive of the Royal Air Force Museum. Reverend Richard Coles will be announcing the winners at the 2018 Museums + Heritage Awards for Excellence on Wednesday, May 16 in the Historic Staterooms of London's 8 Northumberland Avenue in a glamorous awards ceremony. Salisbury Museum's Terry Pratchett: HisWorld exhibition has some tough competition from 6 amazing exhibitions in the Temporary or Touring Exhibition. The full shortlist for the category is as follows. Victoria and Albert Museum, You Say You Want a Revolution? Congratulations to Richard Henry and all the team at Salisbury Museum. To be shortlisted is an amazing achievement and we will have everything crossed that Terry Pratchett:HisWorld take home the award on the 16th May. Audible Australia have named their Most inspirational female characters and the Discworld was represented in Granny Weatherwax. She was ranked no 2 to another witch, Hermione Granger . Following Granny was Brienne of Tarth, Mara of the Acoma, Princess Leia and lastly Anne Shirley. GNU Jan Kant&uring;rek - Jan was the Czech translator of the Discworld series. He had also performed as the Librarian in stage productions. He was awarded "Best Translator" by the Czech Academy of science fiction, fantasy and horrors in 1995, 1996, 1997, and 1999. Discworld was awarded "Best Book Series" in the same years. In 2003 he received an award for his lifetime work in science fiction by the Academy. He had translated over 100 titles. Jan died on the 22nd March 2018 - he was 69 years old. Puffin books have got a brand new web page dedicated to the characters of Terry Pratchett. Puffin is the younger reader branch of Penguin/Corgi books. There is a quiz to do about Johnny Maxwell in Only You Can Save Mankind and a guide from artist Laura Ellen Anderson on how to draw a feegle plus lots more. MourneQuest is a cooperative board game for 2 to 4 players. Players assume the roles of the book's heroes and must journey in the Mourne Mountains to work together to defeat the evil Shimnavore before it is too late. On their quest they'll encounter many enemies, including infuriating Bogbeans and terrifying Nightmares like the Banshee, the Changeling and the Dullahan. To triumph, heroes must gather charms, equipment and magical relics, to increase their powers and use their skills and combat abilities effectively. You only have until the 12th April to back this wonderful game from the guys at Backspindle. Stephen Briggs has been in the recording studio placing down the track for the Josh Kirby Marmaduke Mousington audiobook. The book was published via a kickstarter campaign earlier this year and the audiobook was the last reward to be completed. For those of you who backed it, it should be coming your way very soon. The Josh Kirby Estate has teamed up with Bard games to bring you the Lost Worlds of Josh Kirby, a new and exciting board game inspired by, and featuring, Kirby's epic artwork. While they are still deciding on the final images, you can be sure some of your favourite book cover art will be represented. Bard Games and the Kirby Estate will be launching a Kickstarter campaign to bring this to fruition, so stay tuned for details. 1. To honour Sir Terry Pratchett's description that Greebo's eye "glittered like the sins of angels" each sculpture will feature a hand blown glass eye with a custom infusion of gold leaf powder and liquid clay, and will be hand set by Lyn Marie (the sculptor) , making every piece unique. 2. His "milky white eye" and claws will be individually coated and polished with a pearlescent finish that will "glow" with a bit of demonic sparkle when the lights go out. Yes, it glows in the dark! 4. Special care has been taken to emulate Josh's brush strokes, pulling his mischievous illustration into three dimensions. To make this incomparable work of art available to as many fans as possible, they have three payment plans for you: One payment, four payments and eight payments. How much is this magnificent collector's piece? 177 GBP plus shipping! Peculiar Productions are inviting you (our readers) to join them in celebrating their newly established theatre company Peculiar at Cathays Community Centre, 36-38 Cathays Terrace, Cathays, Cardiff UK, CF24 4HX on Saturday 28th April, from 16:00 to 19:00. Their launch event is a FREE fairground-inspired offering of comedy shorts, games stalls and associated performers--from strongmen to fortune tellers. There will be a short welcome at 16:30 followed by a Big Reveal of their first large-scale production this coming August! Freshly baked goods and FREE drinks will be available throughout the event. Any proceeds from the event will help the company stage its first play, in support of Mind Cymru. They would be so pleased if you joined them! What better way to celebrate what would have been Sir Terry's 70th Birthday? ↑≡2.6 Charity Auction News - VERY Last Call for Items! Last call for auction items! As previously stated, there will be a charity auction at the 2018 Discworld Convention in Chesford Grange. They are literally begging for AMAZING items to auction off for charity. ↑≡2.7 Troll Bridge News - There is STILL time to get your Pre-order in! We have seen this film go from strength to strength and develop so much over the years. We know the team at Snowgum films can see the finishing line and we really don't want anyone to miss out on the opportunity to own a copy of this most Epic of Epics. After all the only way you will get to see this in your living room is by putting your order in asap. This month I have decided to base our trivia questions on Only You Can Save Mankind! Q1. What is the name of the race of aliens in the game? Q2. What was the name of the game that Wobbler wrote? Q3. What would happen if you kept Wobbler's game running for 3,000 years? Q4. What soap opera did Kirsty's mum want to watch? Q5. What is the name of Johnny's local shopping mall? William "Bill" Barnett, Karen Boudicca, Dennis Pelton, Susanne Vanden Bosch, Bobbee Lyn Gerson, Chris Tarttelin, James May, Laura Smith, Sophie Marshall, Peter Kinsley, Ian Thomas, Kim Griffiths, Mark Hayes, Jan Uzzell, Alan Hughes, Pam Oxley, Amy Anderson, Amber Grundy, Mandy Eldred-Tyler, Grace Koscielna, Howard Legg, Sue Gill, Kate Sayer, Chris Riddell, Clare Dimmick, Ben Robertson, Pam Martin, Hanna Stewart, Louise Richardson, Chico Kidd, Chris Petticrew, Reb Voyce, Claire Selby, Kathryn Jones, Andrew Molley, Su Eriksson, Liesel Jungreithmayr, Elizabeth Lamming, Ann Mackenzie and, of course, Sir Terry Pratchett who would have been 70 on the 28th April. Last month we purchased a copy of Only You Can Save Mankind with the new Mark Beech cover to give away. The randomly selected winner of the competition is: Jenny Pierce of Broxbourne, Herts. We'll parcel up your prize and get it into the post as soon as possible. This month we have one of our brand new Soul Music mugs AND a 5GBP Waterstones gift card up for grabs. Q1. Who is the artist that produced the wonderful artwork on the Waterstones gift card? We assume any correspondence is eligible for use in the newsletter unless otherwise stated, including the sender's email address. We may edit your letters using the deeply arcane and very complicated ritual of cut'n'paste. Just a quick private email to you to congratulate you on the new look newsletter. The HTML layout makes navigation much easier with the links rather than scrolling to an item. I'm a long time subscriber to Discworld Monthly living in Darwin, in the Northern Territory of XXXX, and it is great to see what is happening in the broader Discworld...world. Your passion and commitment to all things Pratchett is phenomenal and much appreciated. Congratulations on finding someone in Rachel who seems to share your level of passion for all things Pratchett (possibly passion for other stuff too, but that's your business!) . I also appreciate her efforts and that of the others that contribute to the newsletter, but wanted to personally thank you for all you have done and continue to do! Just to say that I think the new layout is great. I've been receiving your newsletter from the very start and thought I'd be left pining if the format changed. But no, it's great to navigate through and much easier on the eye. * From : "Chris Mabry"
Longtime reader and fan of Discworld Monthly, and love the new look. I did notice, however, that the content links (ie index) didn't work for me (on an iPhone 6s iOS 11.2) . I'm sure this is an Apple Wonkiness issue, and might not even be fixable. To that end, perhaps on the header you could include a "View this on the web" link? Also, saw just tonight that in the U.S. Amazon Prime Video has added The Color of Magic (I know the 'u' is missing from Colour, but here stateside we seem intent upon doing things our own way) . Oddly enough it's in 3 episodes of just over an hour each. Even odder is a 2 episode version available to rent / buy, and another 2 episode version (UK) not available here at all. So search brings up all 3 versions. Weird. Anyway, thanks for all you two do, and ook ook OOK to you! Jason replies: Thank you for your feedback. We have taken your advice and added a "View in your Browser" link for those using Apple devices that would like to be able to use the internal navigation. Sadly, as it says in our editorial, this is a restriction that that Apple introduced in iOS 8 (thank you Andrew Molloy for the confirmation!) and not something we can fix. We are confident that, for now at least, it works for Android and on the wider web. With regards to The Colour of Magic TV series. Originally it was broadcast as two, two hour episodes on Sky. Given the huge number of adverts Sky includes each episode was actually approximately 90 minutes. So two 90 minutes, or three 60 minute episodes doesn't really make any difference to the running time. I'd be interested in where the episodes split though. The first episode ended with the literal cliffhanger of Rincewind and Twoflower falling off the edge of the Discworld. I have been a book dealer at every UK DWCon since 1998 but have decided not to attend any future ones. To that end I have a large stock of UK. Hardbacks that I'd like to sell cheap to clear my stock. They will be priced from 3GBP plus postage. If anyone would like a list of what's available please drop me a message. PS. If you know of a play or event that we don't know about (shock horror) , email us. We like the surprise! Tickets: CHF 18.- Adults, CHF 13.- Seniors and Students (no cards accepted) ; on Thursdays, a special price for students is applied: CHF 10. On Sunday 25th March, the Victorian Discworld Klatch will be meeting at the Charles Dickens Tavern, 290 Collins Street, Melbourne, 3000 at 4pm to raise a glass to Terry. Come to the Charles Dickens Tavern and raise a glass to the man who has given us 35 years of silliness, laughs and lots of books. We'll bring along the game Murder at the Fancy Dress Ball  and if you have a favourite card game bring that along too. Table is booked for 4pm under the first name of our favourite author so first one there gets to rig the cards. 1 Well I've been TOLD it was a game. Might want to be careful if you rock up in a funny costume just in case. Join them for their monthly book discussion! All are welcome for a lively chat and snacks. This month they will be discussing Good Omens by Terry Pratchett and Neil Gaiman. On 28th April, Turistas Del Mundodisco are inviting fans to the Santiago library for an adventure through L- space to celebrate Terry's 70th birthday. The Santiago Library is located at Matucana 151, between Calles Moneda and Avenida Portales. If you come by car you must enter through Matucana street and access the free underground parking lots located almost on the corner of Portales. If you travel by Metro you must reach the Quinta Normal station on Line 5 and walk three blocks to the south. This launch event is a FREE fairground-inspired offering of comedy shorts, games stalls and associated performers--from strongmen to fortune tellers. The UK's largest History Festival which will include talks and events about Terry Pratchett and The Shed of Doom among Living history exhibits and events. The date of 2019 Irish Discworld Convention has been announced, it will be on the weekend of 29th March - 1st April 2019. Memberships will be released on April 19th 2018. This month's issue is brought to you by the Kronan warrior whose revolution failed because only his mum and her boyfriend turned up. 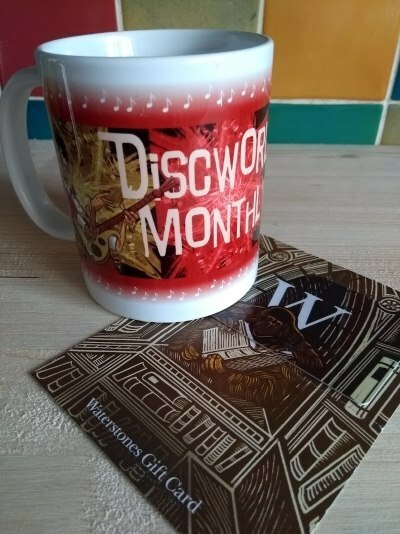 Please let us have any submissions for issue 253 of Discworld Monthly by Friday 20th April 2018. A2. Journey to Alpha Centauri. A3. A little dot would appear in the middle of the screen and a message would show saying "Welcome to Alpha Centauri. Now Go Home". 2.6 Charity Auction News - VERY Last Call for Items! 2.7 Troll Bridge News - There is STILL time to get your Pre-order in!